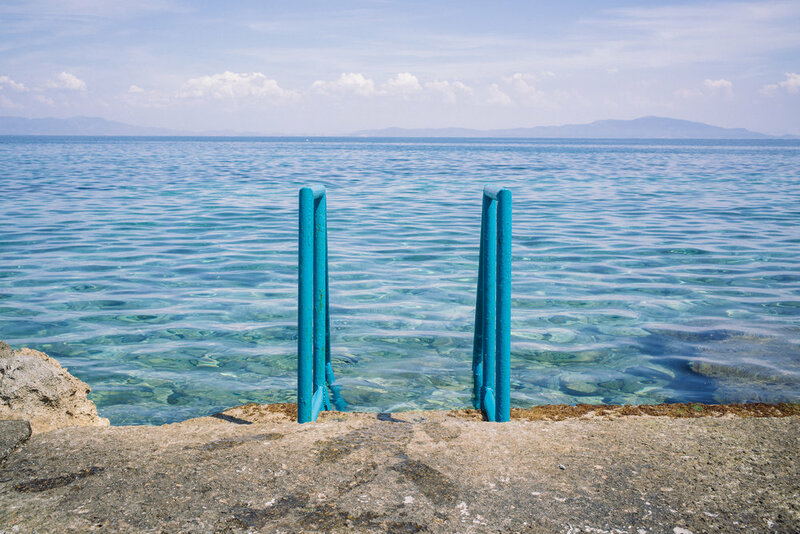 A pool ladder on the Greek island, Lesvos, facing towards Turkey. A mural painting depicting a Muslim woman wearing the Greek flag as her veil just outside the port of Mytilinne. In Europe's attempt to balance its commitment to the EU Project, and simultaneously adhere to the universal human rights in dealing with the crisis, it has created severe tensions both at the national and the societal level, resulting in negative effects on its own ambitions to be an ideological hegemony. Lesvos, one of the many Greek islands that has become the epicentre of the boat arrivals, was once a thriving tourist hotspot before the crisis peaked in 2015. 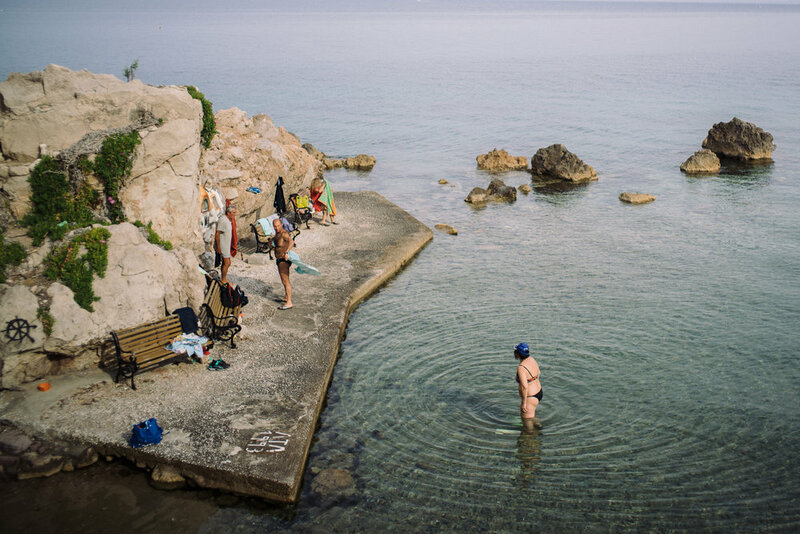 Today, mostly locals frequent the cool waters of the Aegean sea. 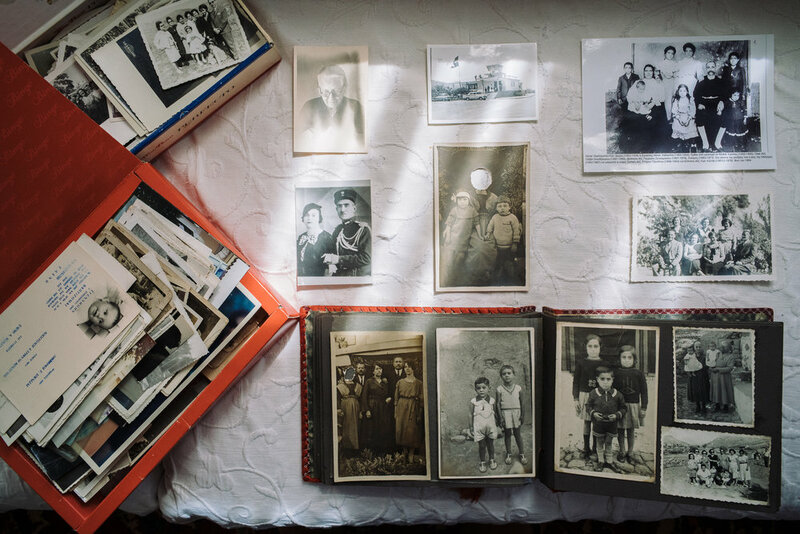 There are still visible traces within the local community of earlier generations of refugees that fled from the Asia Minor war in present-day Turkey to the island. The Greek economy is already suffering from the austerity measures imposed against them before the migrant crisis started to hit its shores. 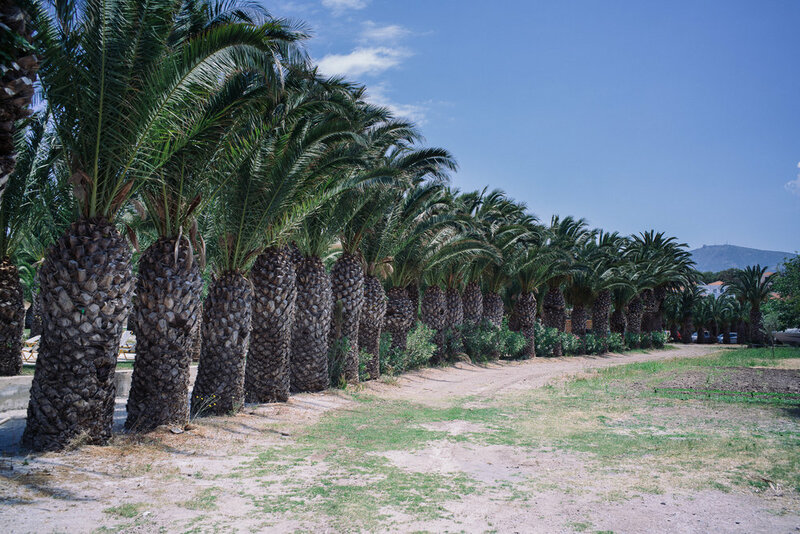 This created a lot of hardships for the people but despite having little for themselves, many Greek people still remain hospitable and welcoming towards the new asylum seekers. A Syrian boy plays football in the public playground late at night, after all the locals have left. 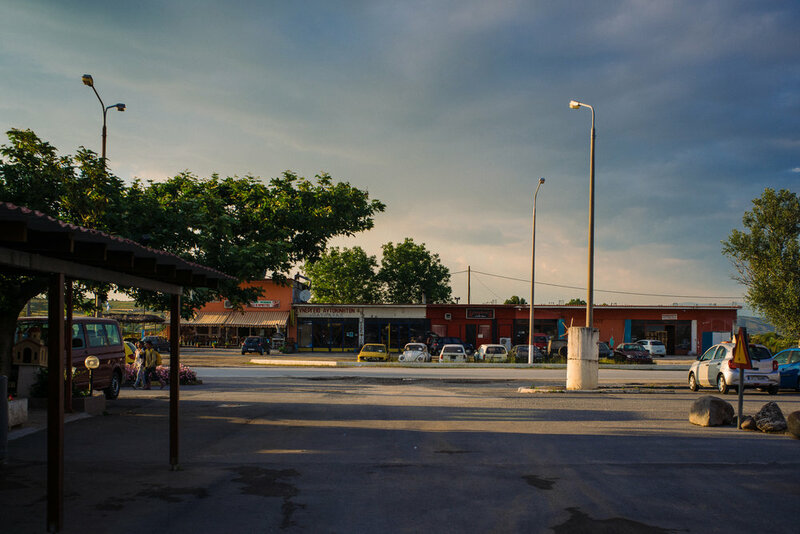 The asylum seekers still face prejudice from a minority of the locals and fearing discrimination, they inhabit the social spaces after the locals have gone. The Park hotel in Polykastro, which has opened its premises to be the informal coordination centre for volunteers in Northern Greece, is softly lit by the setting sun. One of the many different ways the local community is contributing to the crisis. Jobs are created to allow asylum seekers to integrate faster, as seen in Pikpa Camp. The camp is run by a core team of local Greek volunteers. "Some people call them refugees or migrants but when they are here in this camp, they are my people. It is like an open village here," said Mr Stravos, the camp manager for Kara Tepe camp, in describing his attitude towards the crisis. 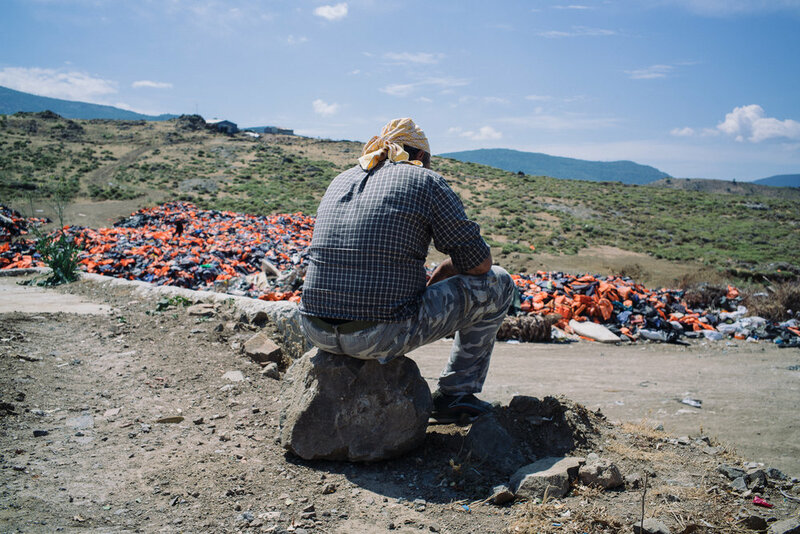 A local caretaker of the life vest cemetery waits in the blazing heat for the next arrival of trucks carrying discarded life vests from the shores to Molyvos. 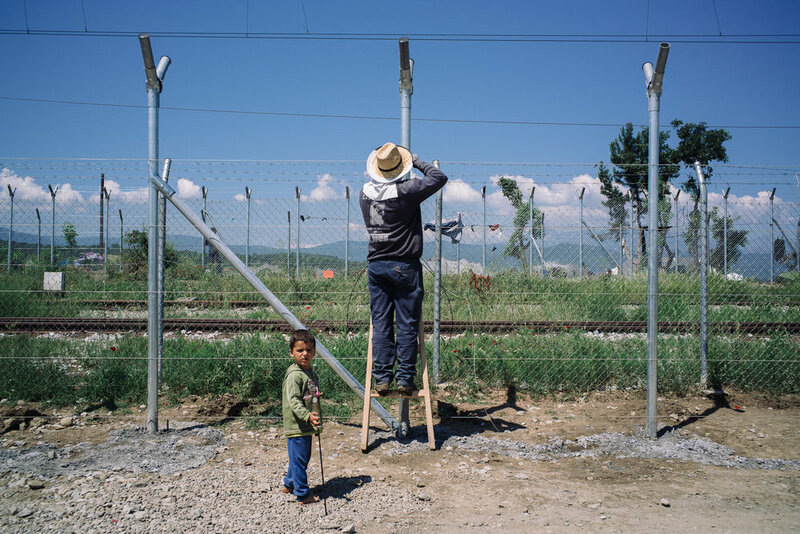 A young Syrian boy innocently watches a man fixing the fence that separates Greece and Macedonia in Idomeni camp. 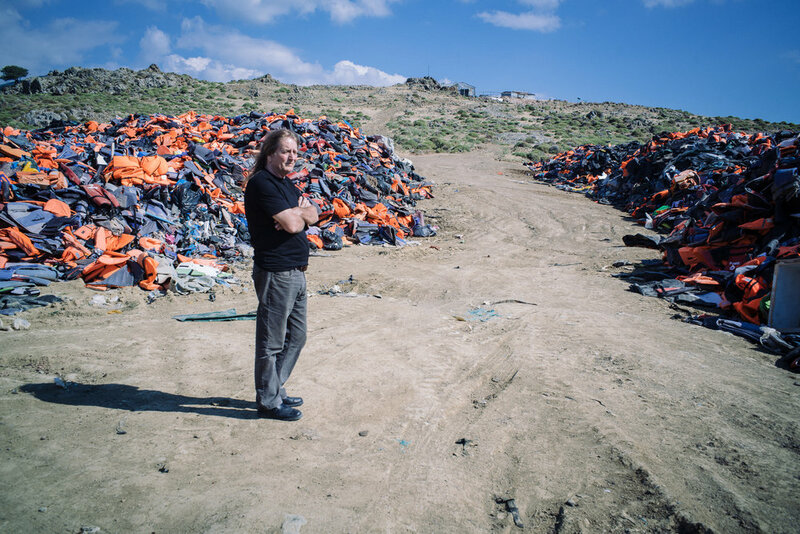 Mr Eric Kempson, a British based on Lesvos, and his family have been very active in providing aid to the asylum seekers arriving along the shores of Eftalou and Molyvos but has been receiving many threats from local groups who told him to either stop giving assistance or to face the dire consequences. He had to send their daughter away eventually for her own safety but continues to work with the new arrivals. 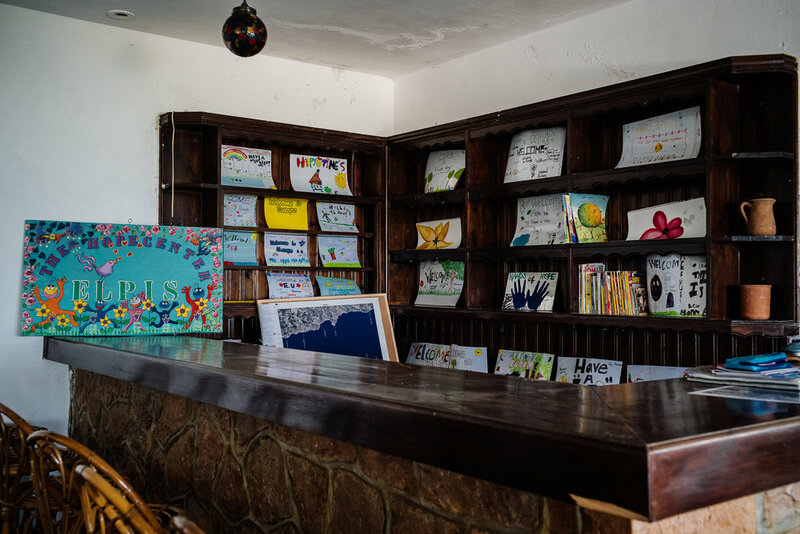 Elpis, or the Hope Centre, is a refuge for those who just arrived onto the island, and was intended to be run by earlier arrivals of asylum seekers and volunteers, but it has been forced to shut down by the local authorities. The Kempsons were also slapped with a hefty fine of €10,000 after they were accused of running a 'hotel' without a hoteling license. NATO and Frontex ships intercepting a boat with asylum seekers onboard just of the closest point between the island, Lesvos, and Turkey. The increased physical presence on the border waters have had mix success in trying to cut off the flow of boat arrivals into Europe. Two police officers bought sweet treats to give out to the children as they went around the camp informing the asylum seekers that they will all be relocated to official government camps the next day. A Greek police escorts a bus full of asylum seekers who are being transported to official camps run by the government. The military was eventually brought in to help run the official government-run camps across Greece. John, a Master Sergeant in the Greek army, oversees the daily operations within the camp, said, "I understand their troubles and feel sad for them. But I don't know how long more can we go on like this, you know?" The increasing reluctance to accept the proposed quota of by each EU member has created serious repercussions on the ground, and especially more so for the Greek people who now hosts over 60,000 asylum seekers in their country. A country that has stood by its ancient values such as Xenia, or hospitality, now faces a dilemma, to continue to carry the heavy responsibility of providing hope and a welcoming space to tens of thousands of people or to shut its doors just as their neighbouring countries did.